This is one of my all time favorite films. It’s a film that is a sort of coming of age story that not everyone can relate to, but it’s still a unique story that stands out years after being released. 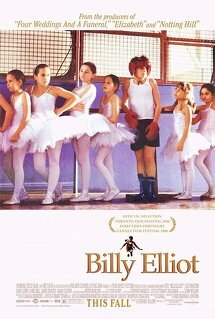 Billy Elliot takes place in Everington Village, a fictional mining town. The year is sometime between 1984-1985 because this is when the mining strike in the UK took place. Billy is 11-years-old and his widowed father is a coal miner and also the union leader. His brother is also a miner and Billy is more or less expected the same once he’s old enough. His father sends him off to boxing lessons but the boy shortly finds a love for dance instead. His dance teacher Mrs. Wilkinson believes he’s good enough to get into the Royal Ballet School in London and tries to convince his father as well. The story is unlike any other film I’ve ever seen. It combines two different worlds: coal mining and dance, which is a very unique combination. There’s many different characters who all have odd yet likable quirks. I love how every character has an impact on Billy that’s different from the last person. Each and every one of the people in his life teach him something different about the world and himself. It’s a story that keeps your attention from beginning to end. Jamie Bell does a great job at expressing the anger and confusion that comes with growing up during this time period. He’s also an incredible dancer which is really shown during one scene in particular where Billy is mad about everything going on with his father so he runs out and dances in the street. To me, that sums up the character of Billy as he expresses so many emotions through dancing. Julie Walters did a good job as Mrs. Wilkinson. She did a good job of showing her support and belief in her pupil’s career but at the same time showing the confusion and questioning that the character is doing about her own life. One of the best performances besides Bell’s comes from Gary Lewis, who plays Jackie Elliot, Billy’s dad. He wants the best for his son but shows it in a poor way and these pent up emotions are displayed extremely well through Lewis’s performance. I also love the supporting performances by Stuart Wells and Jean Heywood. The first is Michael, a friend of Billy’s who enjoys dressing in women’s clothing and the latter who is Billy’s Grandma who likely has Alzheimer’s. This was Stephen Daldry’s directing debut and one of his best in my opinion. He does a great job with capturing these films shots that take place in the streets, including the “Angry Dance” by Billy. There’s just subtle but powerful directing decisions made by him that makes all the difference in showcasing all that needs to be shown here. There’s honestly nothing negative to say about this film. It has an incredibly unique plot filled with memorable and fascinating characters. The dancing and music are just fun bonuses to this movie that’s great all-around.